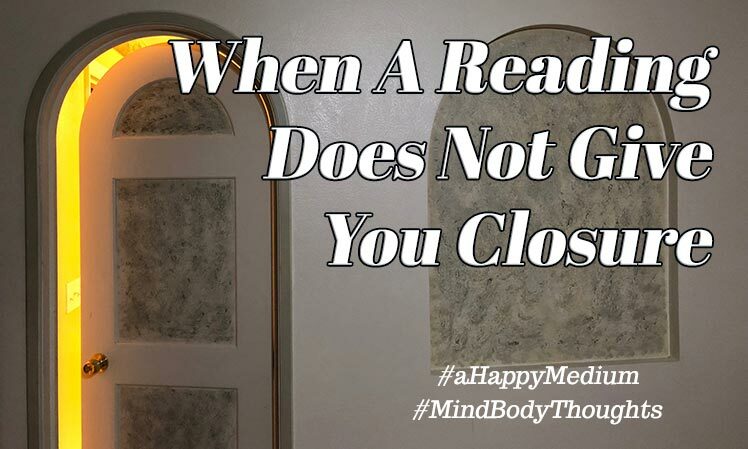 When a reading does not give you closure, there are often reasons for that. When I can’t give you the information you want don’t dismay. Let me explain what I mean. Sometimes clients come in looking to connect with one specific spirit. Sometimes the person they most need closure from does not come through, or when they do come through, I sense that they have their arms crossed or their back to me. It is difficult for the client to hear sometimes as maybe this person wasn’t a super nice person in your life and perhaps you are hoping they’ll apologize for their behavior on Earth or give you the closure you need. As a medium, I’m reading the energy that is around you at the present moment. We like to think that when souls cross over from this life into the next, they have an epiphany and decide that they should make amends with everybody that they interacted with or possibly hurt in this lifetime. I haven’t been there, but I think that there’s a lot of stuff they have to do on the other side. One of these things is a life review, where they spend some time with Archangel Azrael, the angel of death who helps them to look back on their life in comparison to the blueprint they created. They discuss whether the lessons that were meant to be learned on Earth were learned or ignored. I think that souls sometimes need to do some work on the other side in accepting responsibility for their actions here on earth and their interactions with others, especially when those interactions are hurtful or painful. A while ago I encountered this situation with a client. I thought about the reading for a few days after it occurred and I couldn’t understand why this person would not just come through and give the client the closure that was so desperately needed. I sat and meditated on it and was asked to remember that I don’t get to decide who comes through. They decide. They have free will. Maybe that soul was busy doing something else, or perhaps they hadn’t come to terms with it or were not ready to make amends yet. It’s pretty frustrating for me when that happens. I want the best for my clients and my intention for my readings is for the client to get everything they need out of their readings. I ask that they leave feeling uplifted, inspired and perhaps have a different perspective on how to move forward. Sometimes this happens. 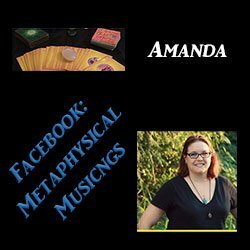 I was able to get a lot of other answers and energy for the client, just not the one that the client was most desperate to hear from in this reading. I can only read what presents. Once I made this realization, it was pretty humbling. Not only do I have to have the trust of the client sitting in front of me, but I also need the trust of the spirit energy that’s surrounding them. There’s so much more at play in readings than simply having anyone sit in front of me. I think that there are specific readers for specific people, and it’s why I’m always hammering home the message that you have to resonate with the person that you choose to read for you. I’m pretty sure spirit lines you up with people that resonate with you. Don’t get discouraged if that one person you were hoping to hear from (especially when you are hoping for them to make amends) doesn’t come up with apologies. Sometimes they don’t. Let some time pass for these souls to do some learning. Perhaps when they are ready, they will come through. Remember that a medium is not there to meet your expectations, although it’s nice when we do. We are here to deliver the messages you need right now at this moment from the energies that are surrounding you. We’re here to provide you comfort in your times of grief, to assure you that the love and the bonds you create in this life endure and that there is life after earth. A good medium wants to give you everything you need. At least that is always my primary intention around my readings, and I can only speak for myself, but I think a lot of readers share that sentiment for sure. If someone doesn’t come through for you, don’t dismay. You will likely get lots of great messages and other spirits. Try again another time, maybe try another reader. Don’t give up, and please don’t feel dejected or disappointed if someone you hoped would come through doesn’t. Forgive, release and move forward. Maybe now just isn’t the right time for that soul, and that’s okay too.